These yummy treats have something for everyone! We are talking chocolate and pumpkin sitting on top of a spice cookie crumb crust here. These little bars are then topped off with a sour cream and sugar mixture and garnished with fresh nutmeg and a chocolate curl! Aaaamaaazingly delish!! Now I ask you...what could be a better dessert for the autumn? I found this recipe at a website called Food 52 and wanted to give them a whirl to see if maybe this would be something I'd like to bring to a football home tailgate party or even to Thanksgiving dinner. They're not that difficult to make...to be perfectly honest the hardest part, as with most bar recipes I've made, is trying to get these little darlings out of the baking dish cleanly. Heat over to 325 degrees F. Combine the 3 ingredients and press them into a lightly greased 9 x 13 inch baking dish. Bake in the oven for 5 minutes, remove an let cool. For the garnish I used fresh ground nutmeg and chocolate curls To read how to make the chocolate curls click here. In large bowl blend together the softened cream cheese and the 1 3/4 cups of sugar. Beat with electric mixer until smooth. Add the eggs one at a time, beating the mixture until blended after each egg. Then beat in the pumpkin, pumpkin pie spice, salt and vanilla. Beat on low speed until all ingredients are blended. Then remove 1 1/4 cups of the mixture and put in separate bowl. 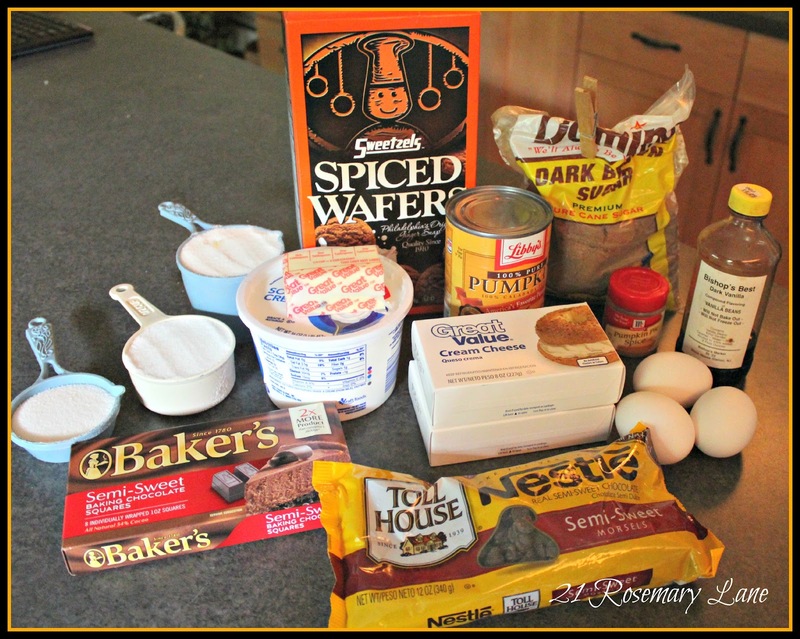 Next in a small heavy saucepan or double boiler, melt the chocolate plus the 2 tablespoons of unsalted butter together. When completely melted and and blended together, pour the chocolate into the 1 1/4 cups of pumpkin and beat with electric blender until blended. 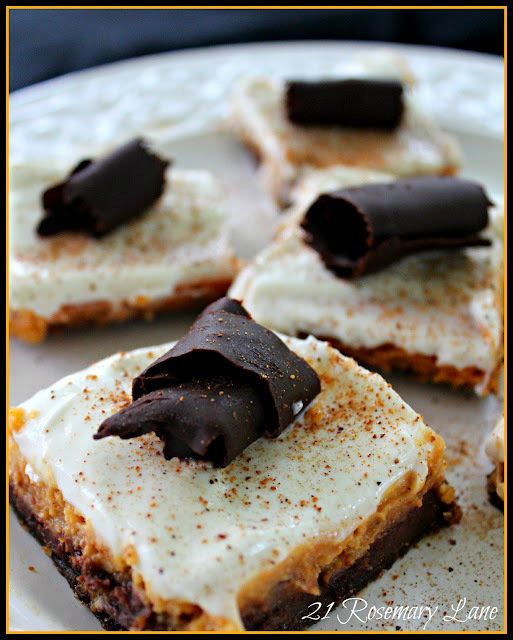 Spread the chocolate pumpkin mixture over the top of the spice cookie crust and bake in the oven for 15 minutes. Spread the remaining pumpkin mixture over the chocolate layer and return to the oven to bake for another 40-45 minutes. Cool on wire rack for 30 minutes. In the meantime blend together the sour cream and 1/4 cup of sugar and then spread over the cooled bars and place in the frig for a minimum of 3 hours. When ready to serve cut the bars and garnish with nutmeg and/or chocolate curls. Update...these bars were much easier to cut and remove from the baking dish after being refrigerated overnight. This goes in my "must make this fall" stack! These bars look incredibly wonderful and festive! Thanks for sharing them with all of us at ON THE MENU MONDAY! These look scrumptious, Barbara! And a good tip for refrigerating them and then removing from the pan--I will have to file that tip away for future use! Looks and sounds so yummy! Pumpkin and chocolate sounds so good. Thanks for sharing your inspiration with Sunday’s Best – you helped make the party a success! would love one right now! HahaHa. You are too funny. No, not on my healthy eating plan but tempting just the same. :D Thanks for sharing. 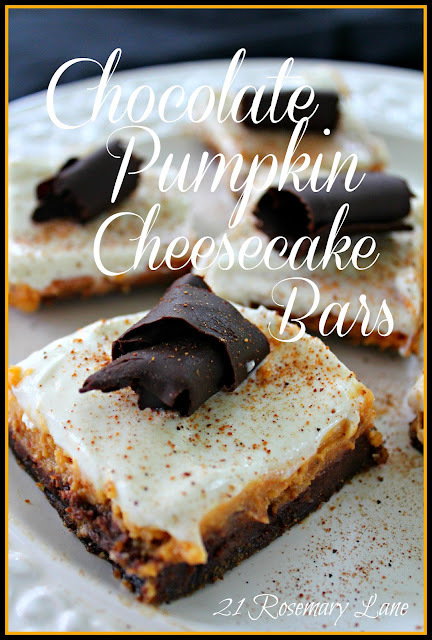 You had me at Chocolate and Pumpkin! What a fabulous combo...can't wait to try these!! !